➊ Enter a number from 1 to N and a letter from A to N into each cell of the diagram of size NxN ➋ so that each number and each letter occurs exactly once in each row and each column ➌ and each number-letter-combination occurs exactly once in the whole diagram. I have to say I'm struggling to see any interpretation where I can see this being a Sudoku - does anyone feel any differently, and if so, why? This is not to say that non-examples (if indeed this is a non example) are not useful in their own right. It is certainly very useful to have non examples to frame any discussion. See also the thread on Irregular Sudoku, which goes the other way. It depends on the Sudoku (Variation) definition. You can interpret Eulero as 3D Sudoku with 2 layers: A number layer and a letter layer combined into one 2D diagram in which the layers influence each other. Each cell is part of 4 regions: numer rows, number columns, letter rows and letter columns. And the puzzle follows strictly the latin condition. Note: This is similar to Twin Sudoku, two diagrams, one solution! I do not insist that Eulero is a Sudoku (variant), but Eulero is a good example that there are different ways of looking at one and the same thing. In my opinion, the only problem I see here is the lack of regions, exactly as latin square. The 2 layers are not a problem for me, and it makes me remind a puzzle I tested for indian sudoku championship 2012. It was a mechanical puzzle. 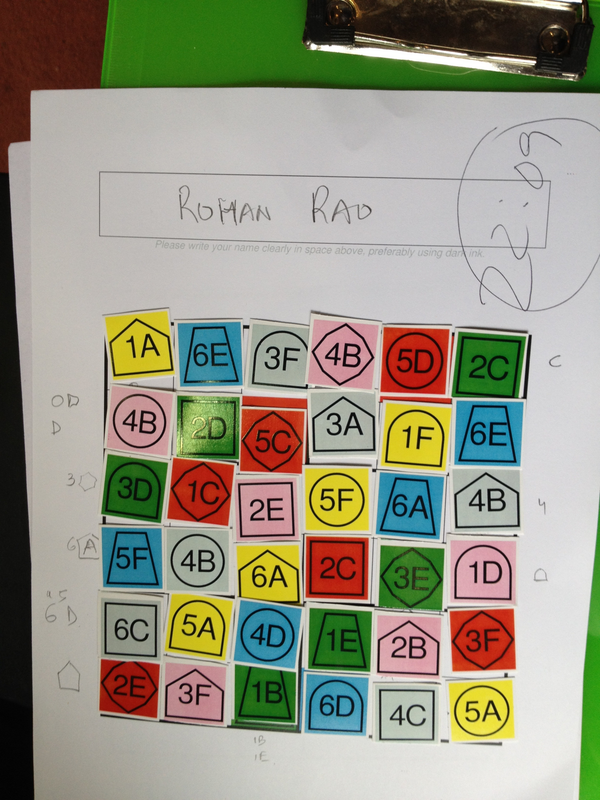 Rules: Place the 36 pieces in the grid such that every row/column and 2x3 box contains each digit from 1-6, each letter from A-F, each colour and each shape exactly once. Please look at the picture of solution here: http://rohanrao.blogspot.com/2012/07/in ... -2012.html or http://2.bp.blogspot.com/-yBZaQPWDpdQ/U ... Sudoku.png . For me, this is a valid sudoku variation (though it could be inappropriate because use of colours). I would be curious to hear Berni on that subject, because he said lack of region is not a problem for him, so I think the puzzle of this thread can enter in his definition of sudoku as stated in another thread.